Skagerak Arena or Odd Stadion as it is formerly known as is a purpose-built football stadium located within the Telemark County city and Municipality of Skien. 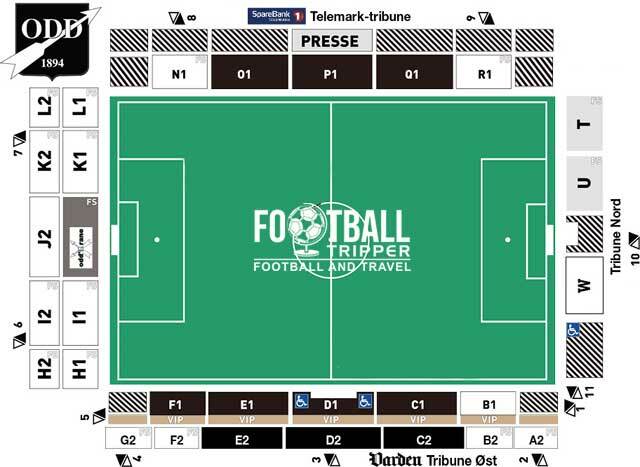 Often referred to as “Falkum” after the area it is situated within, the 13,500 capacity ground is home to Tippeligaen side Odds BK. Written history to be added in due course. Skagerak Arena is comprised of four stands: North, East, South and West. Since Autumn 2014 Odd BK have been running a fan store in the city centre which supplements their official online store. For more information regarding the fan shop and to find out its full address please visit the official facebook page. It doesn’t appear as if any tours are available of the facilities at Skagerak Arena. 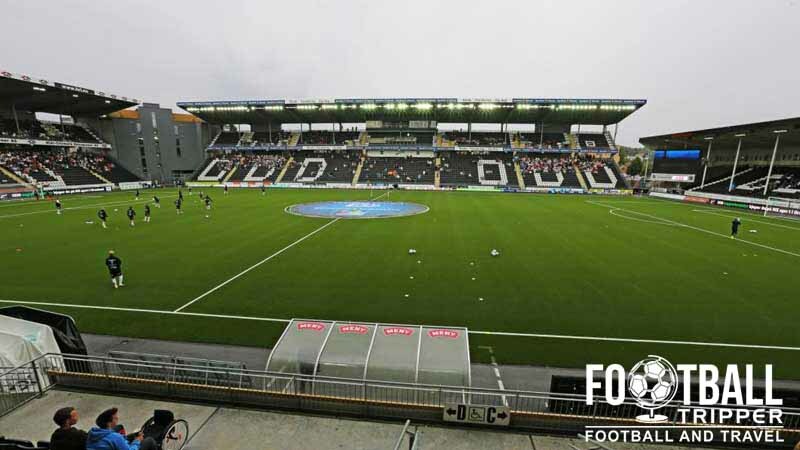 Tickets to see Odds BK can be obtained online and them printed out at home, from the club shop in the Skien city centre, or from the various ticket booths around the ground which specifically open on matchdays. Behind the goals: 125 kr. Be advised that you can save as much as 25 kr per ticket by booking tickets online rather than purchasing them on the day of the match. Skagerak Arena is located approximately 1.2 km north-west of Skien’s city centre which overlooks the Hjellevannet body of water. In terms of walking times most Football Trippers would be looking at a time of around 10-15 minutes. There is a decent sized car park just north-west of Skagerak Arena behind the main stand, as well as a smaller car park to the east. The city is served by two stations: Skien Gamle which is in the downtown area and Skien Nye which is is one stop along northwards. Both are well under 2.0 km away from Odd’s football ground so it really makes no odds which one you travel to. Norway’s railway stations are all pretty classy, and the one in Skien is certainly no exception. Skien Airport approximately 6 km south-west of the city is undoubtedly the closest airport however it only really serves domestic flights to Bergen. Therefore Sandefjord Airport 60 km or so away is the closest International Airport. Of all the hotels in the city centre Dag Bondeheim AS is easily the best value for money, as the other options such as Thon Hotel and Clarion Collection Hotel Bryggeparken are all four stars and at least 40% more expensive.